Pseudarthrosis of the tibia results from a pathological fracture that may occur before or after birth. 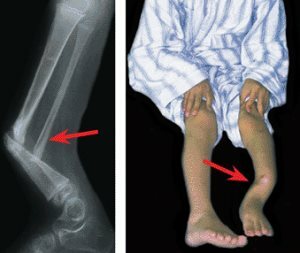 It may be preceded by an anterolateral bowing of the tibia and is sometimes associated with neurofibromatosis. The pseudarthrosis occurs in the distal tibial diaphysis and can be graded by severity. Management is varied and depends on the severity of the condition and the success of previous treatments. Brace Order a total contact orthoses to prevent progressive deformity and fracture. Operative correction Several options are available. Intramedullary fixation First, stabilize with an intramedullary (IM) rod and a graft to promote union. Vascularized graft Consider this option if the IM fixation fails. Place a vascularized graft from the other fibula or immobilize with an Ilizarov device. External fixation The Ilizarov fixator allows a segment of diaphysis to be transported. The pseudarthrosis is compressed while the proximal metaphysis is lengthened. If successful, union without sacrificing length is achieved. Consider grafting the distal docking site if union is delayed. Consider placing an IM rod to prevent recurrent deformity. Amputation Union may not be achieved, even after several procedures. In other cases, only a tenuous union is obtained. The tibia is dysplastic and may refracture, and the leg is short and weak. The outcome is unsatisfactory, and amputation is necessary. The decision to amputate the limb is always difficult, and the decision is often delayed in a futile effort to save an unsalvageable limb. Delaying this decision harms the child.